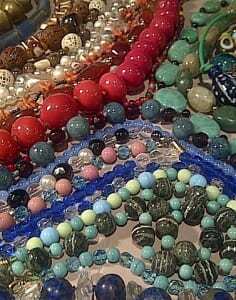 Stefany's bead collecting began in her childhood after WW2. As an art student in the 1960s, she discovered that the story of beads was still largely under-researched. As she collected, designed and sold bead jewellery, she has accumulated a wealth of knowledge about their history and uses. Over the years, her experience with beads of all types and materials and techniques has allowed her to recognise and identify almost any bead by its material, technique, historic origin, trade and use! Taking pleasure in imparting this knowledge to others, while creating beautiful necklaces, she hosts regular bead and knotting workshops.